Media activist Bashir Khadda did not eat solid food for 45 days. The 32-year-old activist from Western Sahara worked primarily with Equipe Media before he was arrested in 2010 and convicted of “complicity in violence” against security forces in 2013. He is now in solitary confinement in Morocco's Talfit prison. Khadda began a hunger strike on September 18. When his health seriously deteriorated, family members pleaded with him to give up the strike, fearing for his life. Khadda suspended the strike on November 2, though he says the suspension is temporary. His coworkers and friends among the Western Saharan citizen media group Equipe Media  are struggling to call attention to his plight and that of other Sahrawi  political prisoners in Moroccan jails. Khadda hails from El-Aiún in Moroccan-controlled Western Sahara , a disputed territory in northwest Africa. As previously reported  by Global Voices, Khadda is one among the so-called “Gdeim Izik 25″, a group of 25 Sahrawi political prisoners associated with a month-long uprising in the Gdeim Izik separatist camp in Western Sahara between October and November 2010. 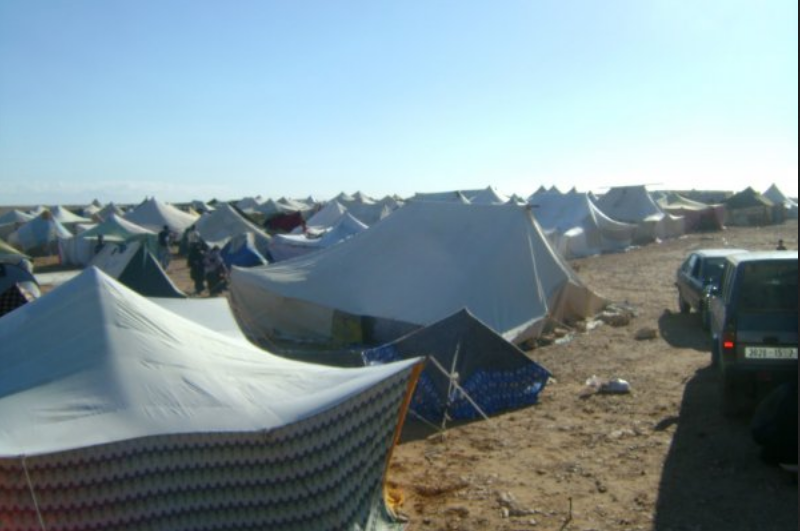 Gdeim Izik  was a camp where Western Saharan activists lived and demanded the end of Moroccan occupation of Western Sahara and the Moroccan government's systemic marginalization  of the indigenous Sahrawi people. In November 2010, Moroccan police and security forces dispersed the camp and riots ensued, leading to the deaths of both police and protestors, in addition to hundreds of injuries and a wave of mass arrests. Multiple activists associated with the protest movement were later arrested, including Khadda, who was arrested , blindfolded and handcuffed along with two other men at a café in El-Aiún more than a month after the dispersal of Gdeim Izik. Bashir Khadda. Photo by Equipe Media, used with permission. Although he was tried along with many activists who were at Gdeim Izik, Khadda denies ever being at the site of the camp on the day police took over. As a coordinator of video archives at Equipe Media, Khadda carried out his work from the city of El-Aiún by receiving footage from reporters at the scene, according to his friend and Equipe Media colleague, Mohammed. A founding member of Equipe Media, Khadda was tried together with other defendants in the Gdeim Izik 25 group before a military tribunal in 2013. The activists were accused of forming and belonging to a ”criminal group” and committing violence against members of the security forces. Khadda was sentenced to 20 years in prison  for “entering into a criminal agreement” and “complicity in violence against security force member leading to death with intent”. Although the defendants were later granted a re-trial before a civilian court, their sentences, including that of Khadda, were largely upheld . In July 2017, a civilian court in the city of Salé (near the Moroccan capital Rabat) sentenced eight of the 25 activists to life in prison. These include two other activists affiliated with Equipe Media, Abdullahi Lakfawani  and Hassana Alia , who was sentenced in absentia after he fled to Spain. A third activist affiliated with the group, Hassan Dah, was sentenced to 25 years in prison. They have since faced hardships  similar to those of Khadda. International observers  reported that the trial was tainted  with irregularities. Khadda and other defendants said  that they were subjected to torture and other forms of abuse to extract confessions. Khadda was forced to sign a pre-written confession that he was not allowed to read or review. He told  an investigating judge in May 2011 that police forced him to sign the confession document while blindfolded. The pre-written confessions were the only evidence presented against the defendants in both the 2013  and 2017 trials. In the civilian re-trial last year a similar scene played out. Pro-Morocco demonstrators were brought in equipped with flags and speakers, creating a very intimidating environment for relatives and supporters of the defendants, international observers Tone Sørfonn Moe and Isabel Lourenco reported . Khadda launched his hunger strike with two demands: to be transferred  to a prison closer to home where he can receive family visits, and to be allowed to study in accordance with the international minimum standard of prisoner’s rights. He is a master's student of law at Mohammed V University in Rabat, but prison authorities denied him further contact with his professors. Although these two demands remain unmet, Khadda suspended his hunger strike at the urging of his family. Thus far, according to Mohammed, Khadda has not received any medical attention during the course of the strike and has only received further threats and mockery from prison staff. Upon receiving the news of Khadda’s deteriorating health, Equipe Media released  a short video featuring interviews with his family. In the video, his brother reaffirmed Bashir’s innocence laments the fact that doing media activism in Western Sahara can result in a 20-year jail sentence. In the video, Khadda's mother is seen pleading for her son to give up the strike before she bursts into tears. In response to his parents’ desperate pleas, Khadda temporarily suspended the hunger strike on November 2, but he is vowing to resume it unless his demands are taken seriously.